The very disciplined ox could be put off by the fun-loving pig. At the same time, the lively pig could be put off by the ox’s very serious nature. If they both don’t loosen up a little, their marriage might be left lacking, predicts the Chinese astrology compatibility. The love compatibility of the ox and pig relationship will increase only if there is encouragement. Both the ox and the pig will drive each other to achieve their goals and become better. When the Ox is dating the Pig, they will be happy together. While they can be good as friends, as lovers their relationship is particularly good. Chinese astrology compatibility predicts that both the ox and pig both share a trait of seduction. They will find it easy to have days devoted to pampering. It would not be uncommon for them to spend a day lounging, having luxurious meals, and napping. Neither of these Chinese zodiac signs are lazy. The ox is actually very realistic and efficient. They adore a domestic life that is calm and balanced. They will be able to become acquainted with their more relaxed, luxurious side with the lover’s help. They are reserved and prefer to stay at home rather than go around in big crowds. The female pig is always very interested in their goals. They also have the ability to help break their partner out of their shell. They are not the kinds who have to be out all the time and find it easy to stay in with the ox. If the Ox and Pig friendship has a problem, it is likely to arise due to their shared stubborn traits. The pig man is happiest when they are getting their own way. Unfortunately, the ox man can find this difficult to give in to. A ox’s opinion is hard to let go of, especially when they feel very adamant about it. Even so, if they are small arguments, these two should have no trouble overcoming them. The pig is very trusting and appreciative and will gladly offer their support to the determined ox. The pig woman is sensual and giving and this can help make the ox male less stubborn and communicate more. They will encourage their partner in bed sexually and help him in these areas. The female ox doesn’t misbehave and tend to focus on their own goals. They are frugal by nature but might think their partner is lavish in spending. Thus the ox pig compatibility might be ruined. The ox woman is still a very realistic individual and because of this will find it hard to deal with the male pig placing importance on luxurious things. But they are actually just loving and giving and this could be taken the wrong way by the Chinese Ox. Work means different things for them. Work is a way for the pig to live their luxurious lifestyle and have more relaxation time. The ox is more serious, working to make sure they are satisfied with their job. There is a possibility these two might clash and this Ox Pig match might breakup. 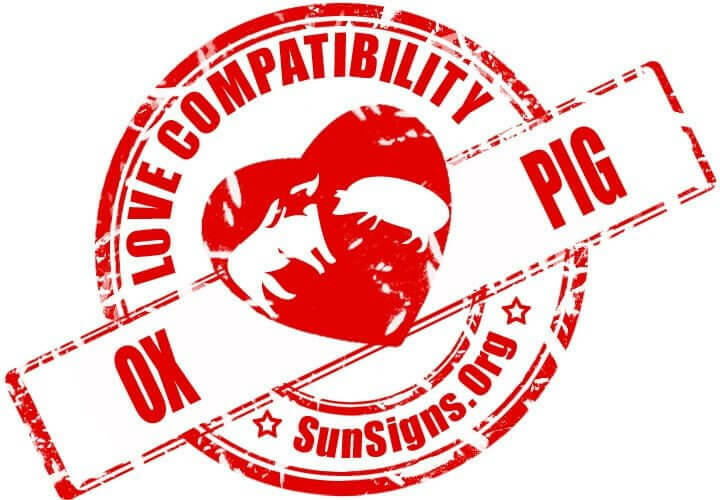 Ox & Pig Chinese Horoscope Compatibility Rated 3 Hearts!